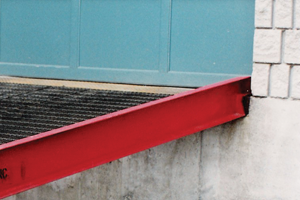 Rampmaster’s stationary steel ramp allows the customer to convert one or more receiving doors to a” drive-in-style” door. The customer now has an option of bringing forklifts down to ground level or bringing vehicles into the warehouse. This style ramp also avoids the construction costs of digging, the placement of concrete foundations, and is worry free regarding drainage around the building. 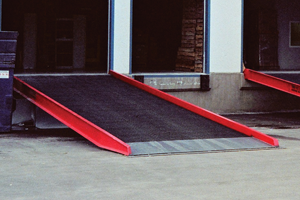 Rampmaster’s standard ramp is 30 feet long, this works with a normal dock height of 48 inches. The purpose of the ramp being 30 feet is so that it will have about a 12.9 % grade or be about 7.4 degrees this angle will make it easy for a forklift with a load to make the grade. The width of a ramp may vary but usually depends on application. All ramps have a 2 x 3/16 inch thick steel serrated bar grating. The ramp comes fully painted. The lead on section is made from steel treadplate and apron at the top is made from 3/8 angle. 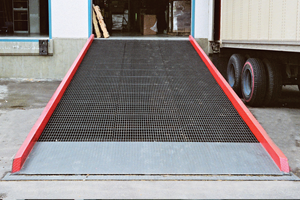 All ramps are made to order and can include delivery and installation within the greater Toronto area. Outdoor tires are recommended. Model SSR12-96-30 – 12,000lb capacity, 96 inches wide and 30 feet long. Apron showing at top of ramp with 8.5 degree bend. A Rampmaster ramp with a normal door to the right.